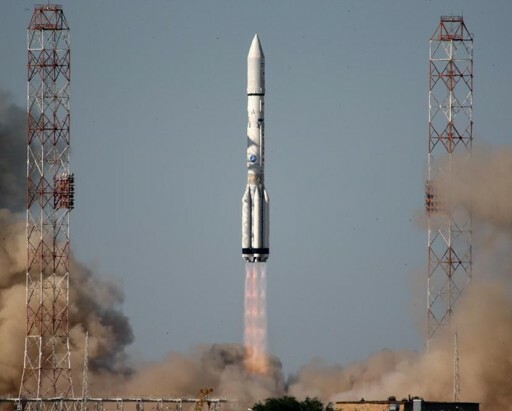 A familiar sight returned to the Baikonur Cosmodrome on Friday when a Proton rocket thundered into the skies over the wold’s oldest space port. Returning to flight after a three-month stand-down, Proton-M/Briz-M lifted off from Site 200/39 at 11:44 UTC, embarking on a long mission of 15 hours and 31 minutes to lift the Inmarsat 5-F3 communications satellite to a Supersynchronous Transfer Orbit. Coming back from May’s failure, hopes were high that Proton could finally leave its losing streak behind as a long-standing issue with its third stage vernier engine could finally be identified and corrected after causing at least three mission failures over a span of 27 years. Fitted with an engine featuring improved materials and a strengthened structure, Proton was declared ready to return to flight, starting with a commercial mission handled by International Launch Services. Despite the departure of many commercial customers, Proton can still look at a busy manifest since it remains the only heavy-lift launcher in the Russian rocket fleet. Proton will continue in that role for several more years as Angara A5 comes on line and begins regular flights out of the Plesetsk Cosmodrome some time in the next decade, ultimately replacing the aging Proton launch system that has been in operation since 1965. Thundering into the skies over Baikonur, Proton was set for a standard ascent mission taking less than ten minutes to complete its job. The first stage and its six powerful engines fired for close to two minutes before the four engines of the second stage took over powered flight, burning for three and a half minutes. Staging events were as expected and the third stage began firing its vernier and main engine in a planned four-minute burn that was completed by the book. Proton’s mission came to a conclusion nine minutes and 42 seconds after liftoff when the Briz-M upper stage was separated. 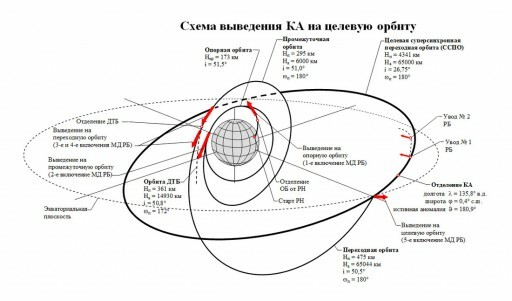 With Proton’s return to flight a success, the mission was far from over as Briz-M set out on a flight of over 15 hours featuring five main engine burns spaced by long coast phase to boost the 6,100-Kilogram communications satellite to a highly elliptical Supersynchronous Transfer Orbit. Spacecraft separation into the expected orbit was confirmed at 3:14 UTC on Saturday after a smooth flight by the Briz-M.
Proton-M countdown operations picked up 11 hours and 30 minutes ahead of the instantaneous launch window with the activation of the Briz-M upper stage that was set for several hours of Guidance, Navigation and Control System testing followed by the upload of its flight software. Teams at Site 200/39 finished close outs of the launch vehicle and ground systems and put in motion final preparations for the hazardous propellant loading operation. Inmarsat 5-F3 went through final checkouts and battery charging under the watchful eyes of the spacecraft team. Eight hours ahead of launch, non-essential personnel started departing the pad for tanking. 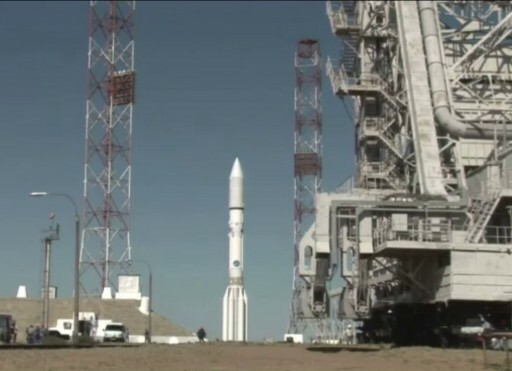 Proton-M was powered up six hours before launch to undergo its own set of final checkouts. 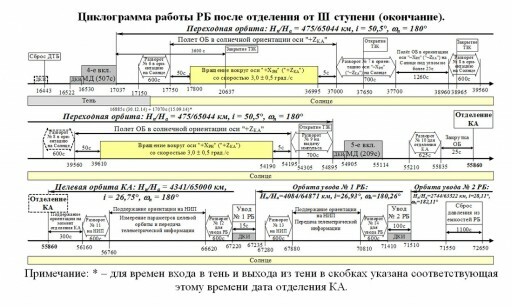 The Russian State Commission met up seven hours ahead of T-0, reviewing the status of launch preparations to clear the way for propellant loading, commencing when clocks read T-6 hours. The three-hour operation saw the Proton rocket receiving 622,075 Kilograms of extremely toxic Unsymmetrical Dimethylhydrazine and Nitrogen Tetroxide propellants. When tanking was complete, the pad was re-opened for the final set of close out operations and the retraction of work platforms from the rocket. The large Service Structure began rolling around an hour ahead of launch, being moved to a safe location for liftoff. The Master Countdown Sequencer was activated at T-45 minutes followed by a synchronization of all clocks involved in the launch operation, from the spacecraft, down to the Briz-M upper stage, the Proton rocket and the ground launch sequencer. The Proton Launch Abort System and the Spacecraft Abort Unit were configured as the countdown approached T-30 minutes and Proton received its flight software. Teams departed the launch pad and the spacecraft team started to transition the Inmarsat 5-F3 satellite to battery power, providing their final GO as part of the ten-minute readiness poll. Proton entered its Terminal Countdown Sequence at T-5 minutes to undergo the last set of steps needed to transition it from a safe state to an autonomous launch configuration. These steps included transferring the Briz-M to internal power, pressurizing the tanks on the three stages of Proton and switching Proton to its batteries. At T-1:53, Proton issued the LV Ready command and assumed control of the countdown leading up to a fully automated health poll at T-3.1 seconds. Upon completion of the poll, Proton ignited its engines. The six RD-275M engines came to life 2.5 seconds ahead of liftoff – igniting and throttling up to an initial thrust stage before ramping up to a full liftoff thrust of 1,014 metric ton-force. Proton-M does not use a hold-down system and started rising from its pad once the engines reached their launch thrust, pulling up the main umbilical located at the base of the rocket until it separated which triggered the Contact Liftoff Command. 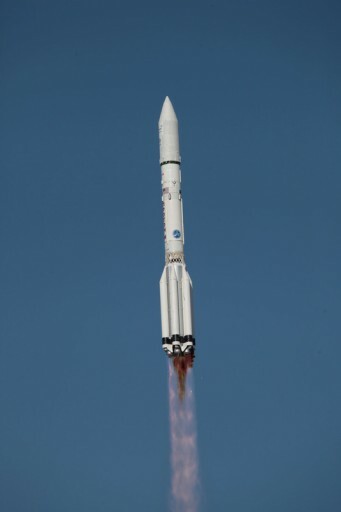 Thundering off right on time at 11:44:00 UTC, Proton began climbing vertically for the first seconds of its flight at an initial thrust to weight ratio of 1.42. 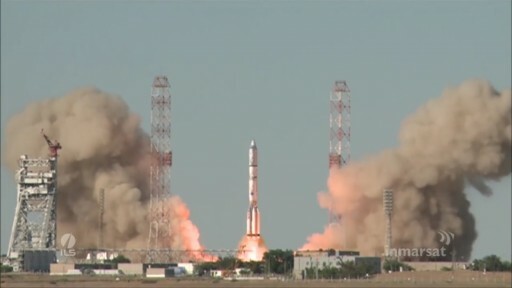 With its six engines guzzling down 3,500 Kilograms of toxic propellants each second of the flight, Proton initiated its pitch and roll maneuver to depart the Baikonur Cosmodrome along the usual 61.3-degree launch azimuth, heading to the north-east towards the Russian border. Proton pushed through Mach 1 and encountered Maximum Dynamic Pressure one minute and two seconds after liftoff, beginning to race downrange. The Launch Bunker reported good structural parameters, stable propulsion and good stabilization throughout the first stage burn. Proton’s first stage, with its iconic external fuel tanks, measures 21.2 meters in length and 7.4 meters in diameter launching with 419,000 Kilograms of propellants, consumed in less than two minutes. Hot-staging was initiated one minute and 58 seconds into the flight when the first stage was shut down, enabling the second stage to trigger its ignition coinciding with the firing of separation pyros so that the second stage could push the spent first stage away as it built up thrust. Clean staging was confirmed by the launch bunker as all four engines of the second stage soared up to deliver a collective thrust of 244,600 Kilogram force. 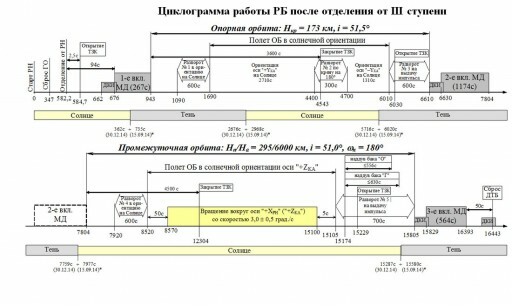 Proton’s second stage uses the more conventional design with one tank atop the other creating a length of 14.6 meters and a diameter of 4.0 meters, holding 176,800 Kilograms of propellant for consumption by a pack of three RD-0210 and one RD-0211 engine, the difference between them being that 0211 sports heat exchangers to deliver pressurized gas to keep the tanks at the proper operating pressure. The second stage performed as planned according to real time calls made by the Launch Team, but the big nail-biter was going to be the third stage burn and the question whether the improvements made to its steering engine were sufficient. Staging between the second stage began with the ignition of said RD-0214 vernier at T+5:24 followed by the shutdown of the second stage three seconds later and the initiation of cutting charges to allow the third stage to pull away from the second stage under the power of the 3,200kgf four-chamber vernier. Ignition of the RD-0213 main engine occurred at T+5:31 and the third stage reached a total thrust of 59,450 Kilogram force. 4.14 meters in diameter and 6.5 meters long, the third stage of Proton held 46,660 Kilograms of propellant for a four-minute main engine burn. By T+5 minutes and 47 seconds, Proton had departed the dense atmosphere, allowing it to jettison its payload fairing, shedding unnecessary weight on its way into space, exposing the Inmarsat 5-F3 satellite for the remainder of its long ride into orbit. Calls from the bunker remained positive as the third stage’s main engine and vernier kept operating according to specification. The main engine was shut down as expected nine minutes and 31 seconds after launch while the vernier kept burning for another 10 seconds to optimize the insertion with its fine control. Nine minutes and 42 seconds into the flight, Proton released the Orbital Unit, consisting of the Briz-M and Inmarsat satellite, into a sub-orbital trajectory. Proton could check a big success for its return to flight less than ten minutes after liftoff, but for Briz-M, the long trip to SSTO was just beginning. After separation, Briz-M entered a stable attitude and coasted to a position near the apogee of its trajectory for the Low Earth Orbit circularization maneuver. Main engine start was preceded by the usual ten-second propellant settling burn of the high-pressure thrusters that ensure the main engine only receives liquid propellant and does not ingest any gas bubbles. S5.98, the main engine installed on Briz-M, ignited 11 minutes and 16 seconds into the flight on a planned burn of 4 minutes and 24 seconds aiming for a circular orbit of 173 Kilometers, inclined 51.5 degrees. 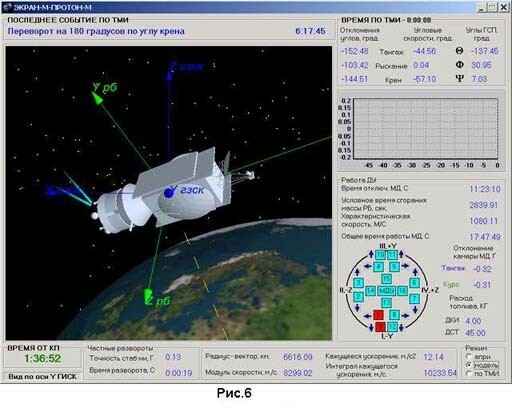 As per its flight program, Briz-M used its own navigation platform to dynamically adjust if flight profile and burn duration to correct any errors after Proton’s ascent mission. The burn was shortened by 3.3 seconds and Briz-M shut down its engine just shy of the T+16-minute mark into the flight. Briz-M has a liftoff weight of 22,170kg carrying nearly 20,000kg of propellants, the majority being carried inside the Auxiliary Propellant Tank of the vehicle. The S5.98 engine of the Briz-M supports multiple ignitions to reach a variety of orbits including Geostationary Transfer Orbit, GSO and Escape Trajectories. S5.98 provides 1,940 Kilograms of thrust. Arriving in orbit marked only the first step in a long mission. As part of a five-burn ascent mission, Briz-M dedicated the next three burns to the raising of the orbit’s apogee to an altitude of 65,000 Kilometers while the final burn raised the perigee and adjusted the inclination. The completion of the mission’s first burn marked the start of a 94-minute coast phase, allowing the Briz-M to complete more than one orbit around the Earth, targeting the descending node of the orbit for the next engine burn so that the apogee could be raised in a way that placed it right above the equator. The burn took place over the Pacific Ocean, lasting for 19 minutes and 57 seconds to boost the apogee of the orbit, targeting a 295 by 6,000-Kilometer orbit inclined 51.0 degrees. The achieved orbit read 301 by 6,008 Kilometers, marking a good Intermediate Orbit Insertion. Next was a coast phase of nearly one lap around Earth since the apogee-raising could not be realized in a single burn due to the limited performance of Briz-M. Therefore, Briz-M needed to coast through apogee and back to the perigee of the orbit, located on the descending node, for the next propulsive maneuvers to continue raising the apogee. Burns 3 and 4 were conducted as a pair, only separated by the jettisoning of the Auxiliary Propellant Tank. The two burns occurred on a ground track from south-east Asia over Indonesia to Australia. The third burn began at T+4 hours and 23 minutes, with a duration of 9 minutes and 23 seconds followed by APT jettison at T+4:34:02. The APT can hold 14,600 Kilograms of propellants while the Briz-M core structure’s tanks launch with 5,200 Kilograms of propellant. The APT was tracked in orbit by U.S. Space Surveillance showing parameters of 357 by 14,852 Kilometers, inclination 50.7 degrees. Shortly after APT separation, at T+4:35:30, Briz-M re-ignited on a burn of 8 minutes 22 seconds aiming for an orbit of 475 by 65,044 Kilometers at an inclination of 50.5 degrees. Achieved orbital parameters were very close to the prediction: 481 by 65,062 Kilometers, 50.5°. Afterwards came a coast phase of ten and a half hours since Briz-M had to climb all the way up to the apogee of the orbit so that the fifth and final burn can raise the perigee of the orbit which cuts the amount of fuel needed by the satellite to enter its operational Geostationary Orbit. The fifth burn started at T+15:15:05 and lasted for 3 minutes and 29 seconds targeting an insertion orbit of 4,341 by 65,000 Kilometers. Burning out of plane, the Briz-M used this last burn to reduce the inclination of the orbit to 26.75 degrees – also to cut the propellant needed by the satellite to enter GEO. Separation of the Inmarsat 5-F3 satellite was confirmed at T+15 hours, 30 minutes and 41 seconds after liftoff, at 3:14 UTC on Saturday morning. After separation, the satellite was planned to establish attitude control and communications with the ground for its initial set of operations including a series of propulsive maneuvers occurring in the coming days as well as the deployment of the solar arrays and communication antennas. Briz-M is tasked with two disposal burns, the first a 15-second maneuver at 6:25 UTC and the second a 100-second burn at 7:35 UTC. 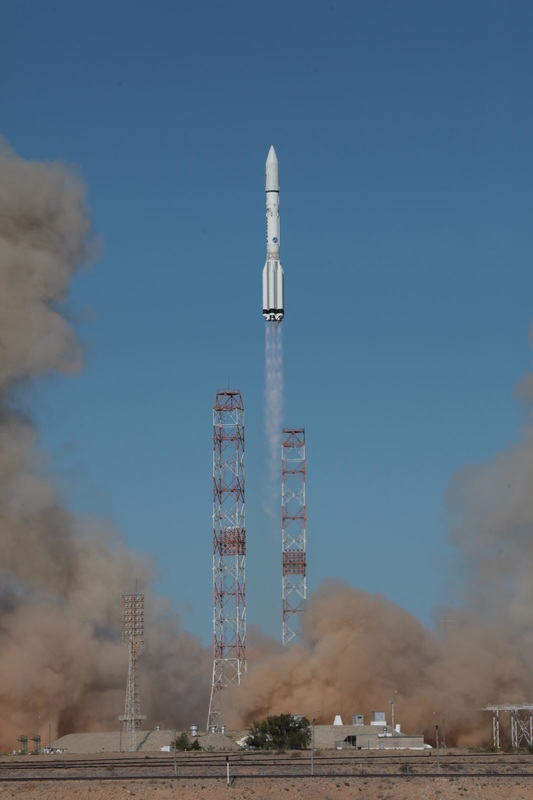 Friday’s launch marked the 405th Proton-M flight since its inauguration in 1965, it was the fourth in 2015. 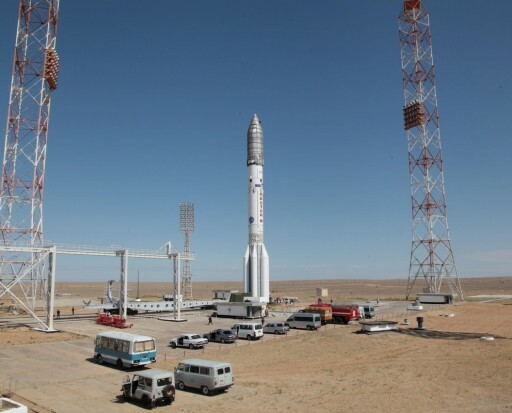 The next Proton launch will loft the Ekspress AM-8 satellite that is already being processed at the Baikonur Cosmodrome for liftoff on September 14.